#11-09 Original antique pool table hooks. 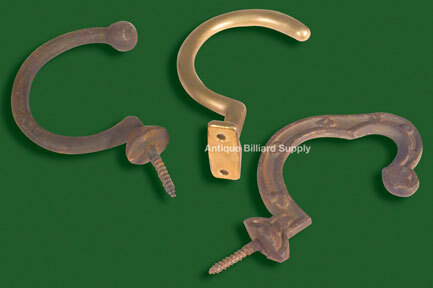 Used on most old Brunswick pool tables to hold the "rake" when not in use. Also used to retain the triangle rack at the foot of the table. Available in round, cast iron style, or fancy brass castings as shown. Priced from $25 each.